Prototype systems that have been developed over the years at IEM are a 60cm (diameter) icosahedral loudspeaker array (20 channel) and a smaller 17cm (diameter) 16-channel array based on a special sampling scheme on the sphere. We thank Josef Schalk and the carpenter Hermann Deutscher for their generous effort to make a solid construction. These systems can create a set of spherical harmonics of low orders perfectly, while the higher orders alias but are suppressed by the wave propagation. On the surface, the reproduction with all the aliasing looks as animated below, Fig. 1. Fig. 1: Surface vibration of spherical loudspeaker arrays that create spherical harmonics. 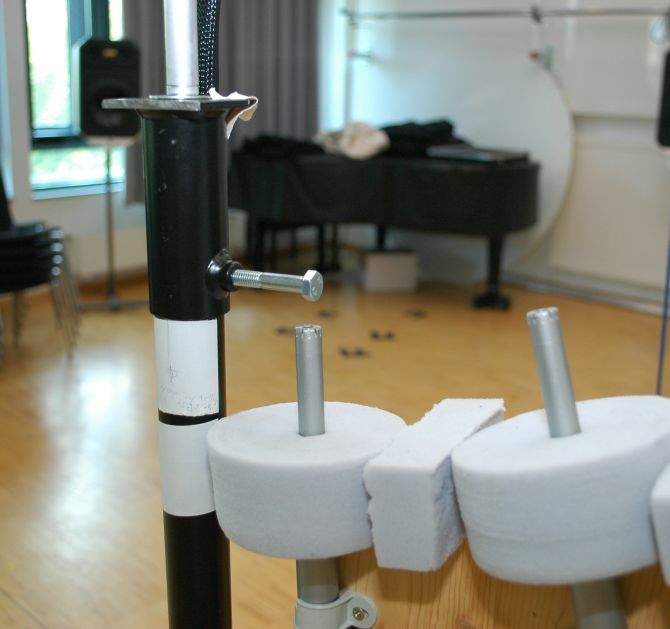 Together with Balázs Bank (this report is by Balázs) the most precise acoustical measurements have been done on both spherical loudspeaker arrays, especially regarding the acoustic centering. The speaker is mounted on a turntable, and its response is recorded by an arc of microphones (semircle), thus a full turn of the speaker gives the response on a full sphere. The loudspeaker units are excited by an exponential sweep separatelly. Since the room is not anechoic, only the early parts of the impulse responses can be used. 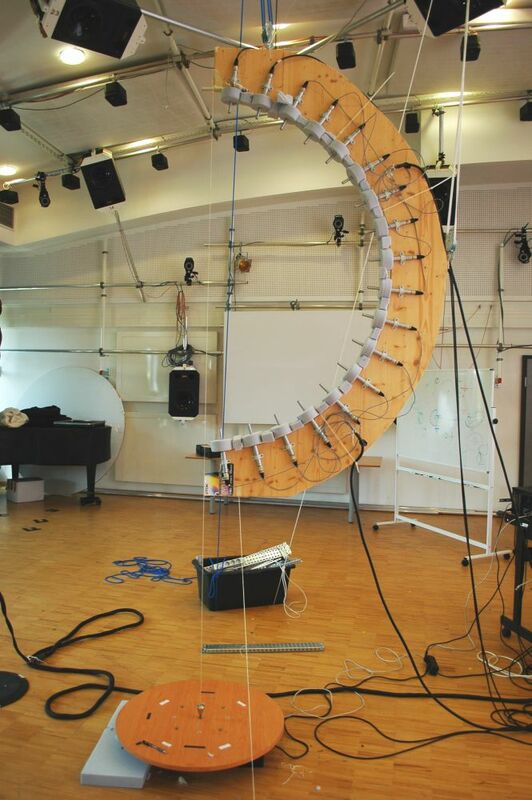 18 Behringer ECM8000 microphonoes are attached to a wooden arc having the radius of 70 cm. The microphones are positioned with a distance of 10 degrees, starting at 5 degrees zenith, and stopping at 175. The microphones are covered by 4cm thick disks of absorbent foam and also spaces between these disks were filled up with smaller pieces, in order to decrease the reflections from the 1.5cm thick wooden arc plate they are mounted on (see Fig. 2.). The speakers were rotated by 10 degrees increment at the vertical axis, giving 10 degrees resolution both in azimuth and zenith angles. Fig. 2: Positioning of the microphone arc and the turntable by the use of a pendulum. The arc was hanging from the ceiling by ropes, and its perpendicularity was adjusted by the use of a pendulum. A large circular plate was screwed to the turntable, and first this was positioned with a pendulum so that the pendulum was hitting the central whole (see bottom of Fig. 2.). This roughly centered the rotation axis. Then the speaker was mounted on this plate with its own stand, so that the stand could be freely moved on the plate. This additional degree of freedom helped to correct the errors coming of the non-verticality of the speaker stand, which would otherwise result in a circular motion of the speaker. Fig. 3: Setting of the rotation axis and speaker position by the help of a paper scale and a pendulum. By the help of a small piece of paper with an x-y scale, we measure the x and y position of the speaker with respect to the pendulum hanging from the top of the arc, giving x0 and y0 (see Fig. 3). Then, the speaker is rotated by 180 degrees, and x180 and y180 are obtained. Now the turntable (center of rotation) should be moved by (x0+x180)/2 and (y0+y180)/2. When this is done, the speaker itself is moved to the center by moving the speaker stand, so that the pendulum is at the zero position of the paper scale. We made more iterations until the top of the speaker (zero position of the paper scale) was in around 1-2mm precision compared to the edge of the pendulum. The height of the speaker was adjusted by the help of a laser pointer, and here the precision is more about in the range of 0.5 cm. The loudspeakers were fed with a signal coming from 2-3 8xio RME converters via RME MADI interface, RME MADI-multiplexer and through 2-3 8 channel Bittner-Audio 8x100W amplifiers. The microphone signals were picked up by Behringer PRO-8 ADA-8000 preamps + converters, and sent via ADAT through the MADI-multiplexer to the RME MADI interface. The measurement was controlled by the PD patch supersweep.pd. We generated a logarithmic sweep (supersweep.m) of 44100 samples, starting from a zero crossing at 50 Hz and stopping at 22050Hz. The sampling rate was 44.1 kHz. For the small loudspeakers, 4th order Butterworth high-pass filters with a cutoff frequency of 300 Hz (supersweep16.pd) were inserted in the signal path in PD. The microphones channels were calibrated by putting a Cirrus CR511E 1kHz calibrator to each microphone, giving a 1kHz sinewave at 94 dB SPL. The speaker is put on an aluminum podest, and the speaker stand is opened to the maximum. As a result, the distance of the lowest microphone from the turntable was 1 m, meaning 2 meters of reflection-free path. This leads to 6ms, (freq. resolution is 170 Hz). Although the podest and the turntable were covered by damping material, so the reflections are might not be that severe, it is safer to consider only the first 6 ms (reflection-free part). The sampling frequency of the impulse responses is 11.025 kHz. The distance of the lowest microphone and the turntable was 1.2 m, giving 2.4 m (7ms) reflection-free path. Note that the mounting screw is on the way of microphone 18 at azimuth 80 degrees and around (see Fig. 4). When computing spherical harmonics, this mic should be weighted lower at around 80 deg rotation. The sampling frequency of the impulse responses is 22.05 kHz. Fig. 4: The screw in the way of microphone 18 at 80 degrees rotation. Hai Morgenstern, Franz Zotter, Boaz Rafaely, "Joint spherical beamforming for the analysis of reflections in rooms", [pdf], Acoustics-2012, May, Hong Kong, 2012. 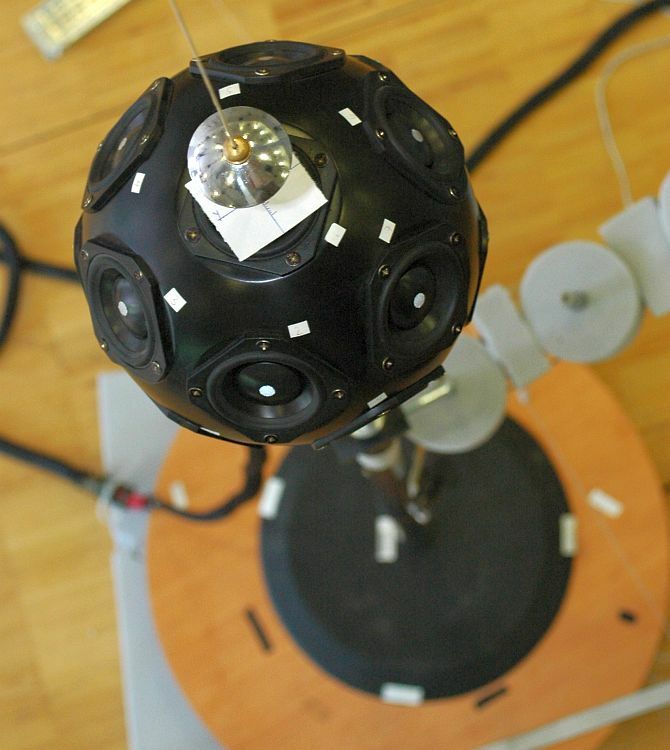 Franz Zotter, Balázs Bank, "Geometric Error Estimation and Compensation in Compact Spherical Loudspeaker Array Calibration", [pdf], I2MTC, IEEE, Graz, April, 2012. Franz Zotter, "Holofonie für Musikinstrumente", Vortrag zur Entgegennahme des Lothar-Cremer-Preises der DEGA, [ppt-Folien-zip-60MB], [Text-pdf]", Darmstadt, 20. März, 2012. Robert Baumgartner, Katharina Egger. "Raumimpulsantwortmessung mit kompakter kugelförmiger Lautsprecheranordnung", Algorithms in Acoustic and Computer Music Seminar, [pdf], 2011. Franz Zotter, Alexander Mattioli Pasqual, "Radiation modes of t-design and extremal-points compact spherical loudspeaker arrays", Fortschritte der Akustik, DAGA, Düsseldorf, [pdf], 2011. Michael Kerscher, Franz Zotter, "Kompakte 16-Kanal-Kugellautsprecheranordnung", Fortschritte der Akustik, DAGA, Düsseldorf, [pdf], 2011. Franz Zotter, Hannes Pomberger, "Spherical Arrays for Sound-Radiation Analysis and Synthesis", tutorial at DAFx-10, Graz, [slides pdf], 2010. Michael Kerscher. "Compact Spherical Loudspeaker Array: Implementation of a System for Variable Sound-Radiation", ISBN-10: 363927945X, ISBN-13: 978-3639279450, VDM Verlag Dr. Müller, 2010. Franz Zotter, "Analysis and Synthesis of Sound-Radiation with Spherical Arrays", Doctoral Thesis, Institute of Electronic Music and Acoustics, University of Music and Performing Arts Graz, [pdf], 2009. Gerriet K. Sharma, Franz Zotter, "Klanginstallation Ikosaederlautsprecher", Poster and Sound Sculpture at European Forum Alpbach, University Forum, read more, 2009. Adrian Freed, Andy Schmeder, Franz Zotter: "Applications of Environmental Sensing for Spherical Loudspeaker Arrays", IASTED SIP 08, Kailua-Kona, Hawaii, [to pdf], August 2008. Roger Schwenke, Franz Zotter, Andy Schmeder, David Wessel: "Room Acoustics Measurements with an Approximately Spherical Source of 120 Drivers", Acoustics08, Paris, [to pdf], July 2008. Franz Zotter, Hannes Pomberger, Andy Schmeder: "Efficient Directivity Pattern Control for Spherical Loudspeaker Arrays", [pdf], ACOUSTICS08, Paris, July, 2008. Hannes Pomberger. 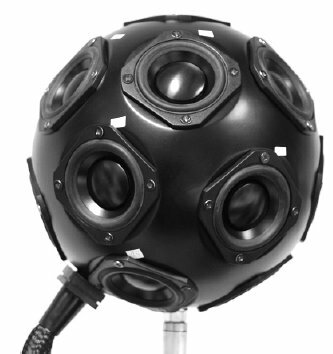 "Angular and Radial Directivity Control for Spherical Loudspeaker Arrays", M. Thesis, [pdf], 2008. Franz Zotter, Andy Schmeder, Markus Noisternig: "Crosstalk Cancellation for Spherical Loudspeaker Arrays", DAGA, Dresden, [pdf], March 2008. Franz Zotter, Markus Noisternig: "Near- and Far-Field Beamforming Using Spherical Loudspeaker Arrays", 3rd AAAA Congress, Graz, [pdf], September 2007. Franz Zotter, Robert Höldrich: "Modeling Radiation Synthesis with Spherical Loudspeaker Arrays", ICA, Madrid, [pdf], September 2007. Franz Zotter, Alois Sontacchi, Robert Höldrich: "Modeling Spherical a Loudspeaker Systems as Multipole Source", DAGA, Stuttgart, [pdf], March 2007. Christian Jochum, Peter Reiner. 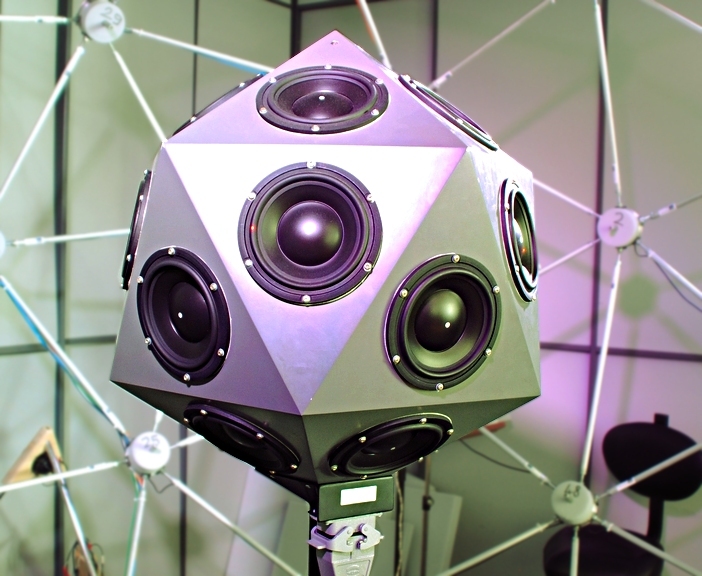 "Driving Filters for the Icosahedral Louspeaker Array", TI-project, [pdf], 2007. IEM-Report 39/07: "Icosahedral Loudspeaker Array", [pdf], 2007. Peter Reiner, Christian Jochum. "Measurement and Evaluation of Crosstalk within an Icosehedral Loudspeaker Array", TI-project, [pdf], 2007.